The AmericartUSA™ electric platform truck with lift table provides a safe, efficient, cost effective, and American made solution to transporting heavy loads or large volumes throughout your facility and eliminates the risk of injury when lifting. With standard and custom sizes available AmericartUSA™ is sure to have the solution for your need for powered carts, and powered lift tables. Size 26″ x 48″ available is for order. The AmericartUSA™ powered platform truck is a safe and efficient mode of transporting any heavy equipment or supplies and pairs well with a powered lift table for certain warehouse and light industrial applications. 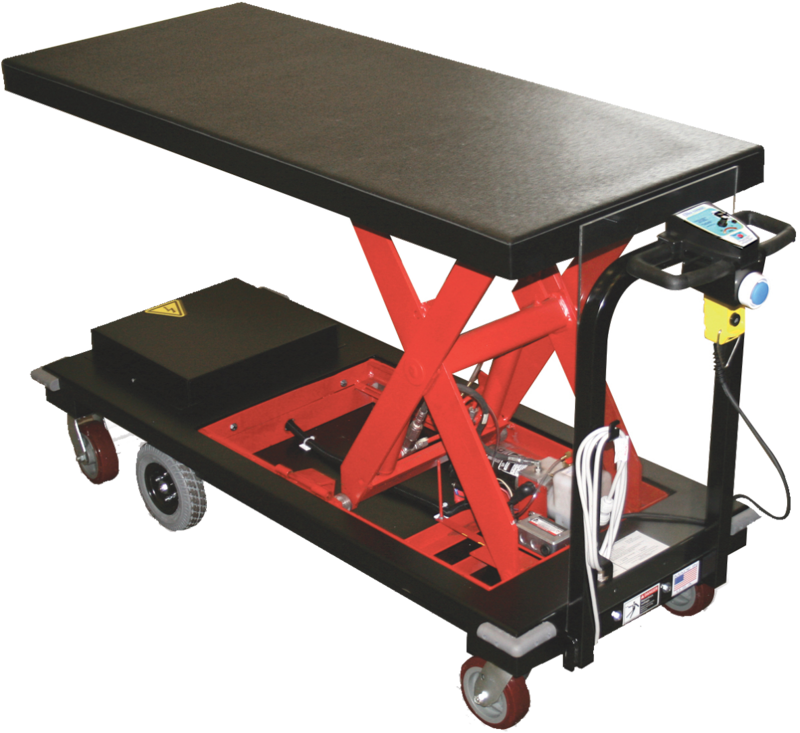 The addition of a lift table gives users the ability to adjust the height of the product they are transporting for easier on/off of product and virtually eliminates the risk of a lifting injury by elevating the base of the platform to a more comfortable height. All AmericartUSA™ products come with a life-time 24/7 technical service hotline and a one-year parts warranty which includes electronics. Contact our toll-free phone number and you will immediately be connected with a technical service representative whom can aid you in troubleshooting and/or ordering parts. The AmericartUSA™ carts with lift table are battery operated and equipped with a self-contained 115V smart charging system. Simply plug the cart into any standard 115V outlet whenever the cart is not in use and the smart charger automatically shuts off when the batteries are full to prevent over charging. Rule of thumb is to keep the units plugged in whenever not in use. The AmericartUSA™ batteries prefer to be charged up frequently versus the usual full discharge of the battery before recharging. The batteries will not form a memory to frequent charging and so will always be ready to use when needed. The AmericartUSA™ Motorized Cart with Lift Table has an exclusive safety feature in the Emergency Stop Switch which immediately stops the cart from movement when engaged. The AmericartUSA™ powered platform carts with lift tables 500lb. load and brake capacity means the cart will stop, and remain in place with a full load at a 6° incline. 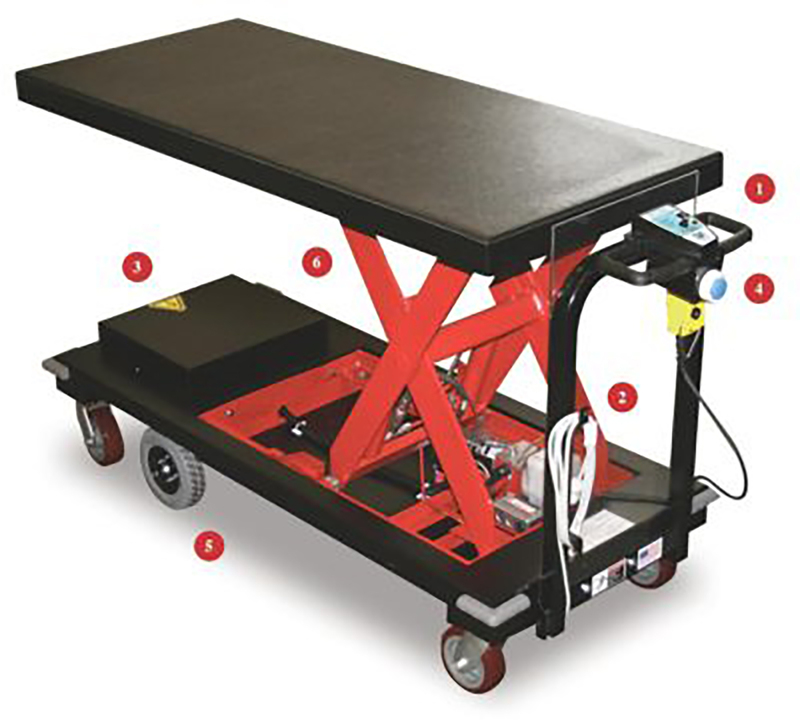 The AmericartUSA™ electric platform truck with lift table eliminates the risk of injury when lifting. The most common applications for the AmericartUSA™ motorized utility carts with lift table are as follows: order picking and delivery, transporting boxes from loading docks, deliver copy paper and bottled water to multiple office locations, maneuvering large packages and mail bags to and from mail rooms, moving parts and other materials to various manufacturing departments. © Copyright 2019 AmericartUSA™, LLC. All rights reserved.